If you don’t already have it installed, you’ll need MacPorts, which is a very easy and helpful tool for installing software. Follow their instructions for getting it set up, then head back here. Want to use something else like Homebrew? I did too, but you’ll regret it. MacPorts is the only option that has everything we need to install, so for the sake of your sanity, I suggest using it. I started with Homebrew and ended up manually deleting everything (a pain) and starting over. Using MacPorts, install GNU Radio Companion, a graphical tool for interacting with the HackRF One. This may take quite a while (like 30 minutes, perhaps more), so be patient! 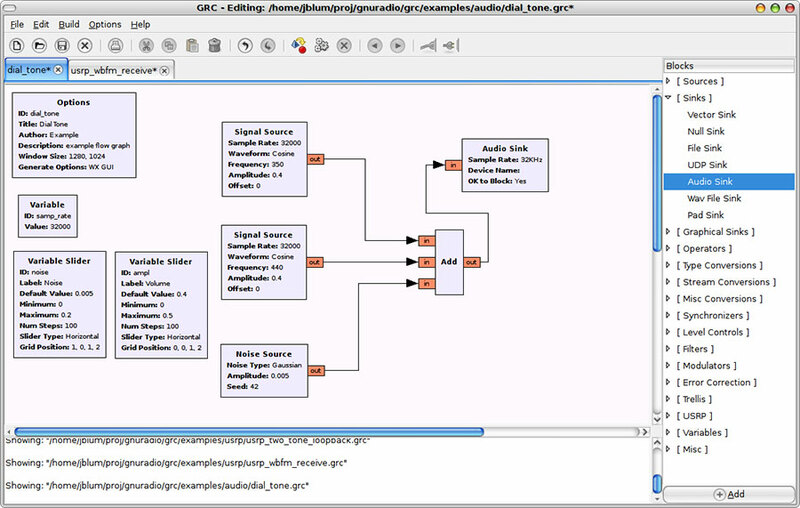 More information and other install options can be found on the gnuradio.org website. If you don’t get an error, you’ve installed gnuradio properly! This should launch the application in a GUI window (like above). Don’t worry if you get lots of errors in the Terminal, that’s normal. If the GUI starts without any fatal errors, you’re good to go. If you got an error box that says “Cannot import gnuradio”, that’s ok! I spent 3 hours tracking down a solution so you don’t have to. Save the file (if you’re in the Terminal text editor, hit Control+X, then Y and return to save). You might need to quit Terminal for the changes to take effect. Then run step 4 again: hopefully it works! You should get a string of data that lists the board’s firmware version, serial number, etc. This one may also take a long while – it will install a lot of other libraries that are required. If you don’t get any errors, you should be ok. 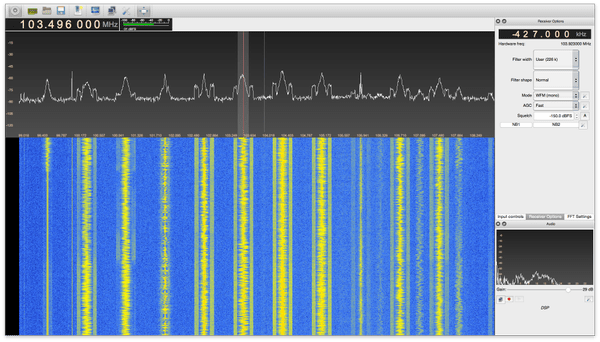 If you want something more intuitive to play with your new SDR device, GQRX is a good option and one of the few available for Mac. Lots of help from this tutorial for this step. It will launch as a full GUI application with some very nice filters and other options built-in. If you get some scary warnings when starting for the first time, just ignore them . You made it! Play with GQRX and tune into some weird stations. 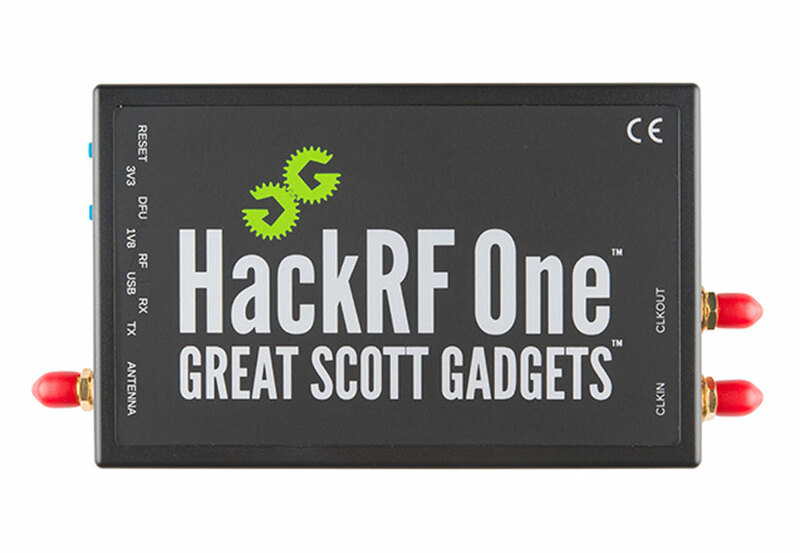 Follow along with the HackRF One video tutorials and build some cool modules. If you run into trouble or have questions, post them in the comments. But I have a problem too, that I didn’t find how to solve it. Here is my terminal log file. Osx is El Captan. It looks like the install got hung up installed doxygen, which is a dependency for gnuradio. I’d try to manually install doxygen (using the command sudo port install doxygen, or from the source code) and see if you can get that to work. With it properly installed, you should then be able to install gnuradio. i was able to install gnuradio after installing doxygen individually. but now when I try to run “gnuradio-companion”, python keeps closing/crashing. also tried to import it into the pthon interpreter but it says the class is not found. I had similar problems myself. I ended up uninstalling everything and starting over a few times. Can’t say what will do it for your particular case, but that would be a good place to start. Sorry I don’t have a magic-bullet fix! Thank you for your blogpost, but I had no luck following it. Do you have any ideas, whats going wrong? Seems to be any Python issue, doesn’t it? Hmm, that’s a weird one. Did you edit the .bash_profile file? It seems like an error finding the Python library. Aehm, I do not have a .bash_profile. I only have a .profile. Should I create one? What should I add to the .bash_profile? Hmm, the step that deals with the .bash_profile file is to comment out (ie: remove) a line. Are you sure you don’t have the file in your user’s home folder? If you find it, you do need to complete that step. If not, the fact that it is missing might be causing the issue (though I’m not really sure how to fix it, I’m afraid!). But, i have NO PYTHONPATH. that means there is an EMPTY-output. May this cause the problem? Should one have a value within $PYTHONPATH? Running echo $PYTHONPATH will give you a blank line (it does for me too). For more info on $PYTHONPATH, what it does and how to set it up, see here. I solved the problem of python where I get an error of importing gnuradio. In macports you should first select your python. After that I was able to load the package gnuradio into python. Thanks Joe – I haven’t tried this recently, but when I attempted to install everything by Homebrew, it broke at the final steps and I had to start over. Did it work for you all the way through? I typed “port select python27”, and I got: “Warning: Unable to get active selected version: The specified group ‘python27’ does not exist. Error: The ‘list’ command failed: The specified group ‘python27’ does not exist.” I then tried the same command for the other two listed available versions for python, and in all cases, I the same error occurred. Any advice on how I should proceed would be greatly appreciated. First, running type gnuradio in the Terminal will give you that error – gnuradio is not a command line command. Second, did you update the .bash_profile file as in Step 5? If not, that could well be the problem. Finally, when I type in gnuradio.__file__ (which tells me where it’s installed), I see /usr/local/lib/python2.7/site-packages/gnuradio. Then, when I look in the sys.path list, I see that /usr/local/lib/python2.7/site-packages is listed. So, if you don’t see that location yourself, you could try adding it to your PYTHONPATH. I would like to uninstall everything, but am such a newb that I don’t know how. Can anyone help? (process:30507): Gtk-WARNING **: Locale not supported by C library. Running almost any GNU Radio graphical interface (GUI) will require downloading and installing X11/XQuartz first. Im very new at this and could use some help. I have a Hackrf on the way. Trying to setup the software. Your page has been the easiest to get this far but I’m stuck now. It seems to have installed ok at the beginning but I can’t get past the testing. What am I missing? update for me. Looking at the other comments I decided to uninstall gnu radio. installed gnu radio thru that. If I go to python no problem but if I try to import gnuradio it doesn’t work. If I go to gnuradio-companion it gives some warning errors but then it opens the GUI screen to start. Im still waiting on my hardware to arrive and see what happens. @Jeffrey – see Step 5 for the import error. I found that you really have to do everything perfectly in order, otherwise it doesn’t seem to work. You may have to uninstall and start over, knowing what steps you’ll need. Hi Jeff. I made all the step above in my mac (macOS Sierra), the gnuradio-companion works perfectly, the hackerf_info works fine too but I can’t find the Osmocom Source block in the gnu, I installed the gr-osmosdr and gr-fosphor as described but no block. Any ideas? I have tried a couple of times. I uninstall gnuradio. Reinstall step by step and when I look for the bash_profile in terminal window it blank. The only thing working is gnuradio-companion. it opens ok. Sorry for all the questions but I’m new and I’m very interested in this to work. So even though it opens gnuradio-companion it still is not going to function correct? @Jeffrey – you need to use sudo in front of the command (ie sudo port select python python27) and enter your password. Only root users can make changes like that. @Arturo – sorry, no idea! Did you try a restart? (Dumb, I know, but maybe?) Otherwise, you might have to ask on a gnuradio-companion or HackRF forum. Thanks much for this set of instructions. Without it, I’m not sure where we’d get started. – The Python ‘import gnuradio’ didn’t work first time around. I didn’t have the .bash files mentioned so I thought I was stuck. I tried an uninstall, a ‘sudo port python select python python27’ and a reattempt at the install. This did the trick. So perhaps the python version needs to be set *before* the port utility does the installation. – The gnuradio-companion is a command-line executable. I got stuck because I thought it ran in the python interpreter. I have no idea how to solve this, could you help me? thanks Jeff, but that doesn’t seem to be the problem, because when I type what is written in point 5 nothing like what you say appears . but it is from 4 years ago and I don’t know if it will work for me, cause maybe I have a different version of python. what do you think? @Júlia – what do you see when you type python --version in the Terminal? If it says you’re on Python 3 I think that would probably be the problem. If it says 2.7 or something like that, I’m really not sure. Did you get any specific errors when installing gnuradio? Hi Jeff, it says 2.7.10. No I didn’t get any errors, what I think is happening is that it was installed in a folder or somewhere and the terminal doesn’t find it, can this be possible? I’m going crazy with this, I followed every step cautiously. When I tried changing the pythonpath there wasn’t any so I created it, and still doesn’t work. @Júlia – pythonpath would be my next guess. Macports should install into /opt/local – if you navigate to that folder you might see gnuradio in either the bin or sbin folders. If it’s there, you’ll want to be sure that path is listed in your pythonpath instead. If that doesn’t work, I think you’ll have to post in the gnuradio Github page or try their Slack channel. Hi again Jeff, macports is installed in /opt/local/var not bin or sbin. Is that a problem? anyway when I open the supposed pythonpath it is empty. If you have no idea why this is I’ll post in the Github.